... after years in production! For all readers of English literary fiction! Get it at Google Play t'day ... cost of a black coffee, is all. Catch it also at The App Store! Here's an accurate and useful homonym and homophone dictionary for all language buffs and students of English! And it also contains a separate dictionary of Words Commonly Confused. With a total of over 9300 words, you won't find a more comprehensive and targeted reference book anywhere else. Buy for only US$2.99 via PayPal! Or if you prefer, click here to purchase using your own bitcoin. 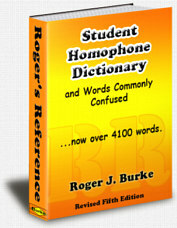 Why a dictionary of homophones only? Well, words that sound the same are confusing — no question. And, homophones are different because of the differences in spelling between word pairs. So, in response to many enquiries, we thought a well priced dictionary of those confusing words would be useful and helpful. With over 4100 of the most common homophones and other confusing words, this is the reference e-book that will help you stay ahead, quickly and easily. Buy for only US$1.99 via PayPal! 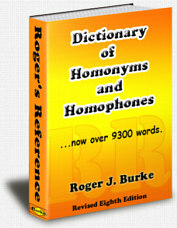 Here's the complete homonym/homophone word list for use as a quick reference! This is by far the biggest and most accurate word list of its kind on the web: over 9300 words in all! Or if you prefer, click here to purchase using your own bitcoin! Here is a collection of my machinations with chiastic quotes, and pithy rhetorical notes. Over 200, in fact! 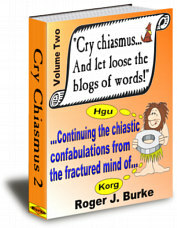 "Cry chiasmus ... And let loose the blogs of words! Volume 1" is full of those twisted and tortuous turns of the language that you may know about. Find out how homonyms and homophones form the backbone of this 3000+ year old rhetorical device, often used by the greatest thinkers and philosophers in history. Get it now, totally FREE. Click here to download. My second collection of original chiastic quotes is now available! 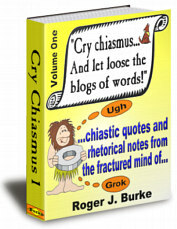 "Cry chiasmus ... And let loose the blogs of words! 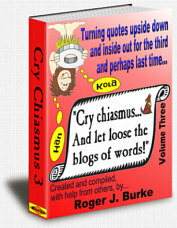 Volume 2" has more than enough quotes to send your friends insane ... 365, in fact. Ripping, once again, into topics like War, Religion, Politics, Food and many others, there is a belly laugh, a quiet chuckle or a wry smile for everyone ... guaranteed! After nine years of literary gestation ... my third attempt to bring some chiastic sense to this world! has gone where others might not. Tearing, once again, into the human comedy, there is now included a selection of my efforts to chiastically explore human sexuality. Oh, you'll still find the usual topics about love, work, pain, evil, food, etc. But now, there are other four-letter words that, years ago, people wouldn't use in print, let alone say! You know the usual meaning(s) - now rest your mouse on it to find out another, not so common, meaning! Dreams of adventure become reality when, in 1961, nineteen-year-old Roger Burke gets a job in New Guinea as a Cadet Patrol Officer. Read a free sample from the ebook and order a full copy here for only $2.99. Complete with forty plus photos of places visited and patrolled during my time in New Britain, you can order a copy - at $14.99 - by clicking the above image. Well, March has ended and still we are working to get the homonym and homophone database converted for mobile app. Design requirements and layout are finalized; the coding and graphics are now under way. Rest assured, however, that all ebooks for this site are still available for the foreseeable future. Only when the app is up at Google Play and The App Store will those products be gradually discontinued. Sherry and I are working as quickly as we can to get the app done. And we apologize for the delay to those patiently waiting. ...for all students and readers of English literary fiction. Get it at Google Play now! And, also now at The App Store. Copyright © 2000-2019 Roger J Burke All rights reserved.